The last two monthly jobs reports were, as they say, nothing to write home about. U.S. payrolls expanded by just 113,000 jobs in January, far weaker than economists had predicted, after gaining just 75,000 jobs in December. The unemployment rate edged lower to 6.6%, the lowest level since October 2008 but still well above pre-Great Recession levels. And average weekly earnings, $832.82, were just 1.9% higher above their level a year earlier; annual wage growth (measured December-to-December) has been below 3% for the past six years. 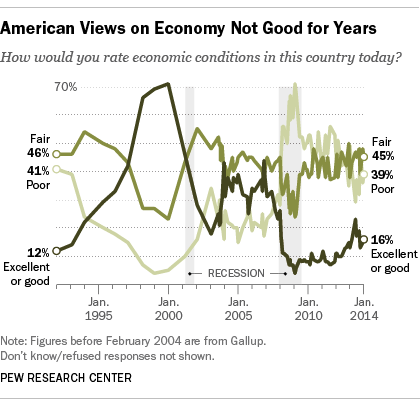 In short, there’s plenty of reason for Americans to feel down about the economy, which they do. But the sour feelings started long before the Great Recession and not-so-great recovery. The last time Americans were unambiguously positive about the national economy, in fact, was during the technology-fueled boom of the late 1990s and early 2000s. In a Gallup poll conducted in January 2000, 52% of Americans termed economic conditions “good”; an additional 19% went so far as to call conditions “excellent.” Of course, by the end of that year the air had pretty much gone out of the dot-com bubble, the S&P 500 was nearly 14% off its high, and the economy was about to slip into recession. Since then, Americans have been lukewarm at best about the economy. Even during the apparent prosperity of the mid-2000s, the share of people rating economic conditions as excellent or good never exceeded 44%, and more typically was around one-third. Even those relatively positive ratings cratered in 2008-09, and never have really recovered; the best reading during the current tepid recovery was 23% this past June. “Now, 33% ‘good’ would be cause for a parade,” commented Carroll Doherty, the Pew Research Center’s director of political research. In a Pew Research survey last month, just 16% of people rated economic conditions as “excellent” or “good,” while 45% rated them “only fair” and 39% “poor.” And according to a new report out today, 33% of people said they’re hearing mostly bad news about the economy, compared with 61% saying the news is mixed and only 5% saying it’s mostly good. The predominantly negative views don’t vary much by party, race or income level, Doherty noted.